I am so excited to share this book with you! I'm re-reading it in preparation for going to Kristen Simmons book launch for the second book in the series, Breaking Point! 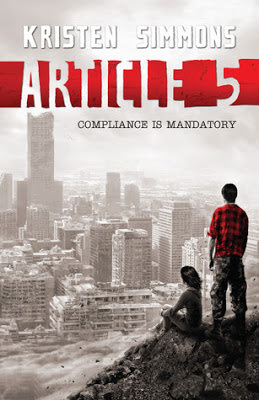 Article 5 is such an amazing dystopia, and I'm so excited to meet Kristen and hear about the next chapter of Ember's journey! Seriously, the action is non-stop and really great. Ember's not sure who to trust, but she's going to fight to survive! This does sound like an interesting premise. Poor Lauri. I bet they don't make it easy to wed either. Nice teaser. I have been curious about this book. Check out my teasers from Also Known As by Robin Benway and Released by Amber Polo. Happy reading!